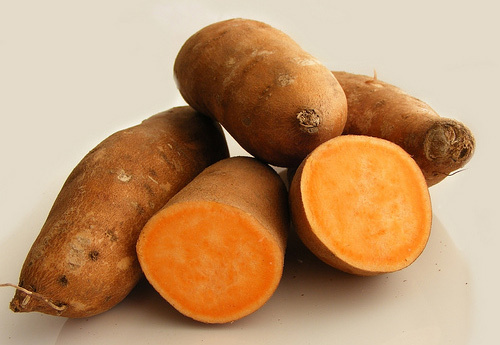 Sweet Potatoes: A Healthy Alternative to White Potatoes? Sweet potatoes are a terrific addition to the diet. Their sweet, somewhat bland, starchy nature makes them readily accessible to just about anyone, and the variety of bright colors they come in naturally makes them appealing to children. They’re full of Vitamin A, C, and B6 in addition to a host of minerals. They also help with inflammatory issues, which regular potatoes can actually cause and they are alkalizing. Eat them instead of mashed potatoes or fries or you can eat them with some butter and a small quantity of unrefined, natural sweetener. they also make a good substitute for pasta or rice as a starch. One thing I did when I was a raw fooder was to spiralize a sweet potato, rinse WELL and toss with a raw Capellini Pomodoro sauce! So don’t save sweet potatoes for the holidays and making pies… enjoy them year ’round as a staple in your diet!